There’s certain pictures that almost every Volkswagen obsessive has seen at one time or another, in big coffee table books about the Beetle from the 1980s and on sites all over the internet. I’m willing to bet that one of the most memorable of these photos is an image of a strange chimera: a half-Beetle, half-van that seems to have been built by the factory at Wolfsburg sometime during the war. While many odd variants of these early Beetles exist, this particular one seems to be a favorite, because there’s something simple and elegant about it. It’s called the Type 81. I should mention that I was reminded of this fascinating vehicle by the Volkswagen Prototypes Facebook group, though many of these images have been in books and on the internet for years, as they’re all, you know, really old. The Type 81 seems to be from around 1941; there’s a set of blueprints of the vehicle dated 1940, so a build date of sometime in 1941 seems to make sense. There was a good bit of experimentation happening in the Kraft durch Freude (KdF — the creepy original name for Volkswagen that translates to Strength through Joy) around this time, with strange creatures like Beetle pickup trucks and box trucks and proto-Kubelwagen jeep-like things, and Beetles bred to run on wood gas and propane. It’s pretty clear that the need for small vans and delivery vehicles was noted by the Wolfsburg factory, and, remember, this was a good nine years or so before Dutch importer Ben Pon gave postwar Volkswagen the idea for the Microbus, and the KdF factory really only had one basic model to work with, so it makes sense that their first attempt at a cargo vehicle would be Beetle-derived. These were most likely built from old VW38 and or VW39 prototype cars (the number denotes the year), and were designed and built by the Porsche Bureau, who was working on the KdF project. The high ride height suggests a Kubelwagen chassis was used, with its reduction gears and raised suspension. The design of the Type 81 is a pretty straightforward adaptation of the basic Type 1/Beetle design. The roof after the B-pillar just continues straight back, creating a good-sized cargo area behind the front seats. There’s a very usable bit of space over the engine, sure, but it’s nothing compared to the much bigger volume of usable space in the middle of the car. These pictures also seem to show some kind of load floor placed at engine height that extends to the back of the front seat area, effectively locking out a huge volume of usable space in front of the engine, below that load floor. Why didn’t the designers think to add a side door? With all the modifications they were doing already, a side door would not have presented any real extra difficulties, I wouldn’t think, and, compared to that rear door, would have made the vehicle much more practical. Looking at those pictures, there’s a lot of strange decisions those Porsche engineers made. Like why does the rear body end so high, leaving the whole lower half of the engine, cylinders and all, exposed below the car? I mean, it looks kinda cool, but that’s a very odd choice. In that same shot you can see an extra gauge on the dash, to the left of the steering wheel, that was likely for cylinder head temperatures, since this design changed all of the usual cooling and airflow design of the normal Beetle-shape. It appears that the rear side vents fed air in between the outer and inner body panels to the engine bay, something that was later used on the actual Volkswagen Type 2 transporter, VW’s first actual production cargo vehicle. The Type 81 is an interesting study in restrictions and constraints, since Porsche was trying to turn a bare-bones economy car shaped like a roach into a usable delivery vehicle with a lot more interior space. I don’t necessarily think this design was really successful, but I have to admit, I love the way it looks. 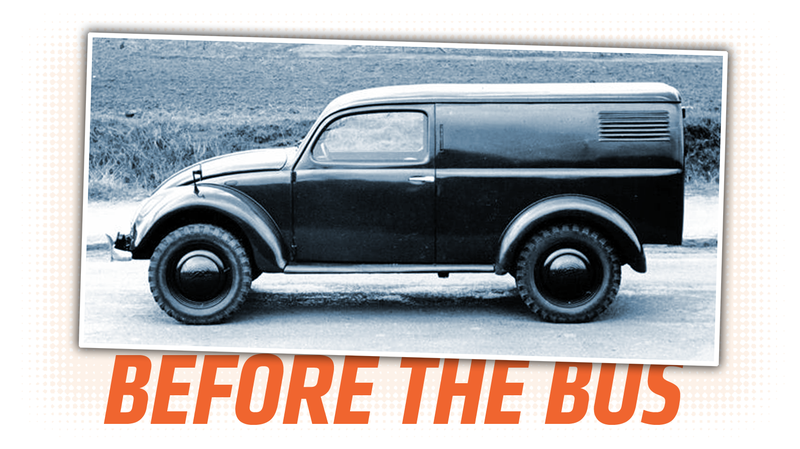 And I’m not alone; this Beetle-van mashup has been inspiration for a vast number of customizers and kit-car makers for decades, so even though Porsche only built one of these, it managed to spawn a good number of strange little offspring. Now someone just needs to build one with a working, useful side door, so I can fill it up with crates of salamis or something and feel strangely fulfilled.